A new bridge housing program in Hollywood aims to help young homeless women get back on their feet. The Aviva Family and Children’s Services program will provide beds for transitional age youth, 18- to 24-year-olds, who identify as female. The women will be housed at 7357 Hollywood Blvd. in a former residential treatment center with 42 beds, including three suites that provide a bedroom for mothers and a separate bedroom for children. Garcetti and Ryu encouraged Angelenos to do their part in reducing the city’s homeless population, which topped 31,000 in the 2018 Greater Los Angeles Homeless Count. “The fight to end homelessness belongs to everyone,” Garcetti said. Ryu, who called homelessness “the greatest moral, economic and humanitarian crisis of our time,” was instrumental in the new Aviva program’s creation by directing $2.3 million in funding from the Homeless Emergency Aid Program to the nonprofit, said Regina Bette, Aviva’s president and CEO. The money will come in handy, as there is plenty of work to be done before the bridge housing program opens this summer, Bette said. Work began last month on bringing the building into compliance with the Americans with Disabilities Act and creating the family suites. “This building is a 1917 home, so it takes a little bit of upkeep,” she said. But once it’s done, the program will have a chance to change the lives of homeless women, who Bette said can be particularly vulnerable to being taken advantage of when living on the streets. “These young women in particular, if we can get them early and give them the support they need … we’re setting them on the course for a brighter future,” Bette said. Not only will the Aviva program offer a place to live, clothing and three meals a day, Bette said, it will also include classes on independent living skills and financial literacy. Residents can also work toward earning a college degree or GED and learn job skills in the kitchen, beauty salon and apparel room. 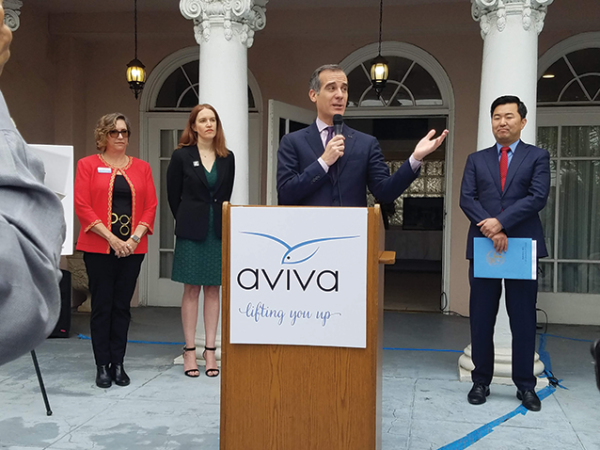 Aviva’s bridge housing program isn’t alone in Los Angeles’s efforts to combat homelessness. Proposition HHH will provide $1.2 billion to build thousands of housing units, and Measure H will fund $355 million per year for services and programs for those in need. Additionally, Garcetti’s A Bridge Home program aims to build temporary shelters in each City Council district that will give homeless people a place to stay until permanent housing can be found. Ryu’s proposed A Bridge Home site is located at 3210 and 3248 Riverside Drive in Los Feliz, and he submitted a motion to the council Feb. 6 for approval. “Together, we’ll bring our unsheltered neighbors home,” Ryu said.